A proposed bill entitled “An Act Providing for Absolute Divorce and Dissolution of Marriage in the Philippines” was approved for the very first time by the House Committee on population and family relations with no contention. As of now, Philippines and the Vatican were the only nations that have no divorce laws. 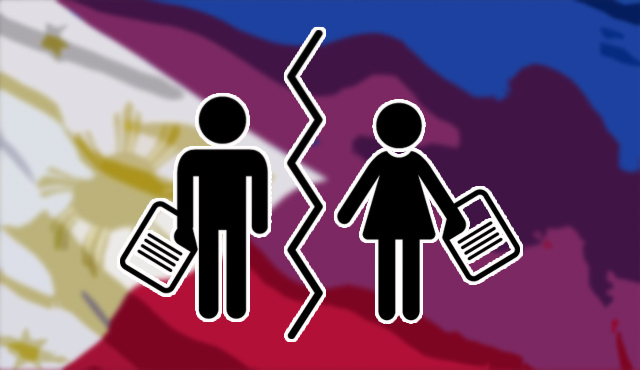 Filipino couples only split through an annulment that costs Php 250 K and above. Among the members who gave their nod on this measure were Rep. Emmi De Jesus, Rep. Edcel Lagman, Speaker Pantaleon Alvarez, Rep. Rodel Batocabe, and Rep. Pia Cayetano. Alvarez and Lagman who were both authors of the yet to be numbered bill congratulated each other when it was accepted. During a press conference, Lagman revealed that the bill will reach the committee level next week and thought that a divorce bill is easier to pass than the controversial Reproductive Health bill. Under the proposal, married couples can end their marriage for various reasons: irreconcilable differences, abuse and infidelity. Spouses who are separated for more than 5 years can file for a divorce if their reconciliation is highly impossible unless their separation is because of overseas employment or both lives in different regions. Gender reassignment surgery, psychological incapacity, and irreconcilable marital conflicts can also be valid reasons to have a divorce. Rep. Lito Atienza who is one of the opposition in legalizing divorce believes that if the measure will implement, it will only aggravate the problems of distressed families. During his interview, he said that it will not help in solving the problem but rather many couples will opted to file for a divorce. If you do it that way, our society will also be destroyed even before we develop. Atienza also insists that if a couple is not yet ready, they should not get married. The pro life lawmaker then stated that he has a scientific basis for his claims and will present it to his fellow legislators.